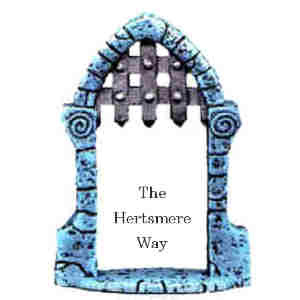 News and views about The Hertsmere Way and its support routes will be posted here. You can offer your posts for inclusion (with a name credit) by e-mail (see the Contact page). Below the News, this page also includes a list of walkers who have completed the main Way and/or its support routes. spotting the original ambiguity on the Photos page (so its my mistake, not Hertsmere's!). There are 13 pubs on or just off The Hertsmere Way - why not take a photo or two and e-mail them in? - see the Photos page for a list of the pubs and their locations. I have been walking the Way systematically to compile "Directions". This task is now complete (28 sections - 14 on the main Way, 14 support routes). These directions now need to be written up". The routes of two sections have been amended (for the better! ), both are now a little longer. These affect the route through Potters Bar and round the Willows Farm Village and Lakes area near London Colney. The route in this latter area may change again in the future (also for the better!) if current proposals to improve the rights of way network there become reality. The effect of these two changes on the overall length of the Way will be posted here. Inevitably there have been several minor changes as well, but not enough to alter the route significantly nor alter the length of any sections. If anyone is itching to have a go at the Way (! ), then let me know by e-mail or e-form (see the Contact page) stating where they would like to start, and I will write up the directions in that area first and forward them on. It would be useful to have one or two "pioneers", who can provide feedback on the directions etc. As well as walking just the main Hertsmere Way in 5 or 6 linear legs using public transport or two cars (just over 48 miles), the main Way and all its support routes (except for one 2.8 mile support route section) can be walked in just five "circular" walks (one loop with an unshared section segment double-back, and four figures of eight) totalling just under 79 miles (8.1 mls, 15.2 mls, 16.8 mls, 18.8 mls and 19.7 mls). The exception section (Potters Bar-South Mimms) can be walked as a double-back (5.6 mls) or as part of a loop (7.1 mls). Thus all the Way routes can be completed in just 6 walks totalling 84.2 miles (or 85.7 miles) - or even just 5 walks if the exception section is added into an adjoining "circular" walk as a double-back. A further 0.5 miles can be shaved off the total if the exception double-back is walked one way off route, reducing the overall total to 83.7 miles! These longer and shorter walk options will be made available soon.